Mary Oliver’s gift of making you look anew at nature is well documented. Still, I approached Owls and Other Fantasies: Poems and Essays, with some trepidation. Was this compilation of poems about birds just a slick packaging/re-marketing of her previous work? It could be, but of the 26 poems appearing here, 10 have never been collected. In addition to the poems are two outstanding essays, including one written for this collection. I’m not a birder — I can pick out the main ones, but my wife and teenage son know far more that I ever will. But no knowledge is needed. Instead, Oliver’s poems show you birds through the unflinching eye of a nature observer. This is not a collection of cute bird poems — it is a celebration of these creatures in their beauty and frightening power. Owls are portrayed as highly efficient killing machines. In her essay on owls she says “In the night, when the owl is less than exquisitely swift and perfect, the scream of the rabbit is terrible. But the scream of the owl, which is not of pain and hopelessness and the fear of being plucked out of the world, but the sheer rollicking glory of the death-bringer, is more terrible still.” Both of her essays in this collection are a natural fit within her poetry. Her prose writing is also poetic, even when describing a small bird her and her partner raise after it is injured. and does your soul need comforting? Even those not of the birding persuasion will find this to be a volume worth spending a couple of hours with — I recommend on the front porch. For those with birding friends, this will serve as an accessible entry into the world of poetry. 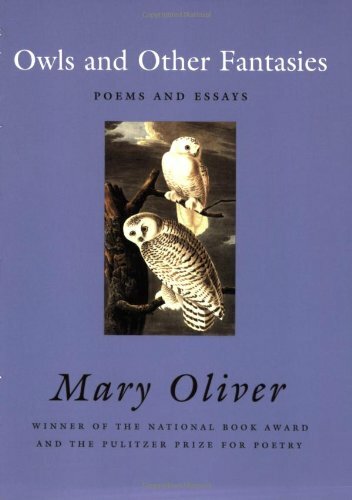 This entry was posted in Poetry and tagged birds, mary oliver, owls and other fantasies, poems, poetry by derekemerson. Bookmark the permalink.